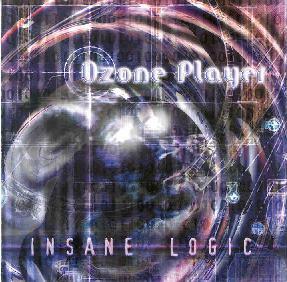 Ozone Player - "Insane Logic"
Ozone Player is a solo sound experience by a guy called Otso Pakarinen located in Helsinki, Finland. He has been making music since the early 70's in several groups and under different pseudonyms. Insane Logic is his first CD album and is a 50-minute trip through the weird and wonderful world of Electronica from Finland. It is littered with atmospheres that motion in and out of abstract order/chaos. It was recorded between 1993 - 2000 and it states on the inside cover that much of the music on this CD is influenced by "The Nights Dawn" trilogy by Author Peter F Hamilton. The album flows like a sci-fi film soundtrack and revolves like a Vangelis/Tomita style of sound creation would. It has its moments of mellowness and its moments of hecticness. 'Whales in Fog' is the first track and is a nice piece filled with crystal clear sounds and a strange haunting melody. While 'Shipping is a piece that would sound great on an unaccompanied Piano, if you know what I mean? It works into 'The Reality Dysfunction' and on this track we are offered an almost Blade Runner Vangelis feel. It is 7.31 in length so it has peaks and slopes all over, very mellow/chaotic. 'Casino Mobile' and 'Minibar' are both up-tempo dancey tracks but not quite, the first has bits and pieces of Keyboard vocal pads on it, maybe they are real voices. I can't tell. The latter is better than the first in my opinion for it offers better riffs, so to speak. 'Insane Logic', 'Beam', and 'Process' all glide through the realms of atmospheric sound creation. Sometimes haunting but never straying from their states of ambience. Great headphone stuff. It's just a shame that these tracks were not explored further and possibly made longer. 'Warezz', 'Shortcut to Nowhere', and 'Transport' slip into something a bit different. Once they get started they all have elements of a not quite dance sound but more English 80's keyboard bands. But better obviously! They also have a state of the art computer game soundtrack feel about them. Insane Logic is a bit too nice sounding for me but it has some good moments. It is very surreal in places, sort of Tomita style noise expansion. Very Vangelis sounding in others. But Ozone Player has created a sound of his own that would rightly stand along side both of the people that I have mentioned above with ease. For more information you can visit the Ozone Player web site at: http://www.ozoneplayer.com. Email at otso@ozoneplayer.com. Contact via snail mail c/o Oy Visual Power Ltd; Sörnäisten Rantatie 27 A; 00500 Helsinki; Finland.